UPDATE: Kū I Ka Mana sold out the final performance! Mahalo to all for your support. Read Vanessa-Lee Millerʻs review of Kū I Ka Mana for Hitting the Stage. Kamehameha Schools Hawaiʻi High School is excited to present Hōʻike 2018: Kū I Ka Mana. March 15 & 16 at Koaiʻa Gymnasium. Shows will begin at 6pm. Tickets are $5. Available at the door or at the high school office or Student Activities Center after school 3-4pm beginning February 12. During the week of the performances (March 12-16) tickets will also be sold at the box office at Koaiʻa Gym after school. 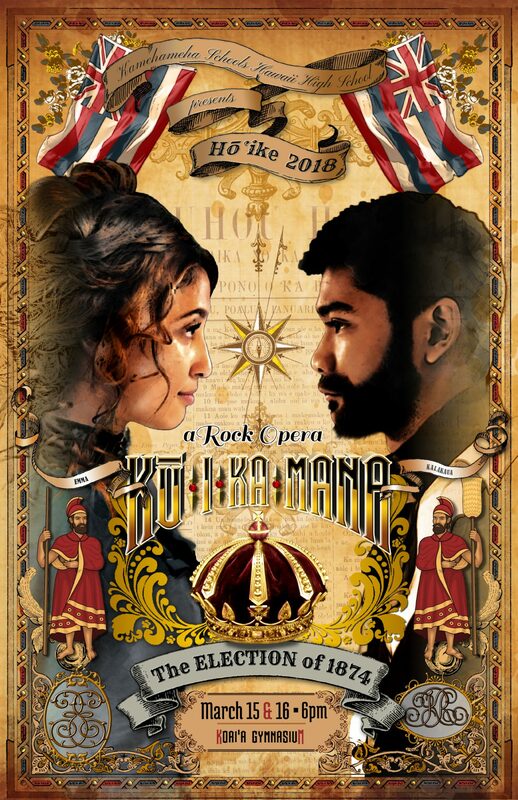 Kū I Ka Mana is a fictional re-telling of the events leading up to the election of 1874, after the death of William Charles Lunalilo left the Kingdom of Hawaii without an appointed successor to the throne. In the running are Queen Emma, beloved by the people, and the charismatic David Kalākaua. Bernice Pauahi Bishop also considers being part of the election, having second thoughts about refusing the crown when offered to her by Lot (Kamehameha V). The results of the election would have lasting repercussions on the Kingdom of Hawaii, setting the stage for many of the events that have shaped the modern 50th state of the United States. The production will be presented in English and Hawaiian. Click here for a complete synopsis of the opera. Kū I Ka Mana will be presented as a rock opera with libretto by theater kumu Eric Stack and music by choir director Herb Mahelona. Modern dance choreography by guest choreographer Jenn Eng will compliment hula choreographed by Kilohana Hirano, Piilani Kaawaloa, Hanakahi Perreira and Kalehua Simeona. Also contributing are student choreographers Mara-Jayde Brown (’18), Kāʻeo Cachola (’18) and Alexia Iwamoto (’18). Costumes are by science kumu Layne Richards with help from historic designer Iris Viacrusis. Set and lighting design are also by Eric Stack. A stage band prepared by band kumu Willie Harris will accompany the show. The entire production is designed around a Steampunk theme. Poʻo Kumu Lehua Veincent and Hope Poʻo Kumu Phil Aganus are producers. Kamehameha Schools Hawaii High School presents their Hōʻike annually in the spring as an all-school event. All high school students participate in the production as actors, dancers, musicians, or crew. This year the production will also feature the KSH Elementary School Keiki Choir under the direction of Cynthia Debus, and the Mamalahoe Chapter of the Kamehameha Alumni Chorus under the direction of Herb Mahelona. All Hōʻike productions focus on some aspect of Hawaiian history or culture presented to the public with the goal to educate our haumāna and to share with the community. It is a unique opportunity to celebrate Hawaiian culture, history and language, and to instill pride and appreciation for things Hawaiian. In a change from past years, the student body will be dressed in black, wearing the monograms of either Emma or Kalākaua. T-shirts will also be on sale at the performances.